During the interview, Galhorta was asked about protecting the legacy of the Ford Bronco. He remarked, "I promise, it will not come out wimpy. It will be true to its roots." Hack, Stampede.Offroad and AUcruiser100 like this. I can't put much hope on some subjective or qualitative statements. Maybe he thinks building it out of marshmallow fluff would make it "rugged", and propelling it with a firefly in a jar would make it "powerful." I doubt he would tell you that the 1.6L engine in the Fiesta is "wimpy" either, but it would sure do a **** job of pushing a 2 ton SUV around on 33" tires. At this point I can't believe much of anything without some objective or quantitative info from Ford. It's all starting to look like pie in the sky without anyone willing to say anything that doesn't sound like marketing nonsense after 2 years. Is there somewhere I can actually find a video or transcript of this interview? Wanted33, BONESTOCK and BroncoRevital like this. Well, this is all very underwhelming. I'm not surprised because of all the releases Ford has going on but to just have generic answers and info regarding the Bronco is disappointing. I just hate that the link on the homepage of the site now lists the Bronco as 2021. It better be right for the year delay. Remember this is a business and it is responsible to the stock holders. Stock performance is not good right now so they need to take care of the flag ship models like the Explorer, F-Series and the Mustang first these pay the bills, and maintain market dominance. I am sure Ford is still testing the market for a rugged SUV to compete with the Jeep. The Bronco will probably not sell like the trucks or the Explorer. They have to keep priorities in line with running a business. here is the Video.. about 21:00 is the questions on the Bronco well... I have to wait another year! Stampede.Offroad and 78CreamBrownie like this. Thanks for the video link. He was very candid when talking about the Bronco. He states it has to be true to its roots and keep the elements that make it a Bronco. I am hoping he means it is going to have a removable top, 2 doors and off-road worthy. Ford stated in an earlier interview that it won't be a Moab slayer and I am ok with that, but I will not be ok if it can't do some of the easier trails in Moab. The new Ranger was tested in Moab and did quite well on some of the easier trails so it better do at least as good as the Ranger. I am hoping it has more in common with the Raptor's off road capabilities than the Wranglers. There are tons of open wheeling options around the USA that don't involve going 1 MPH on 40 inch tires at a 28 degree angle. I did hear confirmed earlier this year from Ford that the Bronco will have the removable top option, 2 & 4 door and higher ground clearance with future options for Raptor version. well... I have to wait another year! Given the complex design and tooling process of vehicle production, that would mean that even by now, several fundamental design qualities [and capabilities] have been determined around which many of the other components and design elements must adhere to. Ford execs and engineers haven't been sitting on their thumbs for two years. What qualities are known? What Bronco mysteries are you most eagerly waiting for Ford to reveal? And what do you think they're waiting for before they reveal them? I'm even more certain of this now. In Kumar Galhotra's (president Ford North America) interview he makes some clear statements that directly support the idea that Ford could tell us what their intention is for Bronco design and capability whenever it suits them. The interview begins talking about Galhotra's work with Lincoln in the past and how the philosophy of "be clear who you are" helped improve that line of products. That same "be clear who you are" philosophy was applied to the Bronco, which holds a similar position as the Mustang for Ford as a "passion product", and "protecting the legacy of the Bronco" was necessary for its success. "we are very clear on what the expectation is" ... "that sits in the public psyche"
"Which are the key elements that make the Bronco the Bronco? And we're very clear on those, so we're going to stay true to those"
"What kind of capability makes a Bronco a Bronco? We're very true to that part"
And sadly at the end the interviewer asks "Some sort of timing" and "This year?" regarding when we'll see it, and the responses: "I can't wait to tell you" followed with "No, not this year"
As disappointing as it is to hear that last bit about the Bronco actually being a 2021 release rather than a 2020, it does make the leaked info from Dana about the axles being slated for 2021 and potentially the Getrag timeline of 2021 for delivery of the 7-speed manual make sense. If I recall correctly those were both due for delivery in Jan 2021. 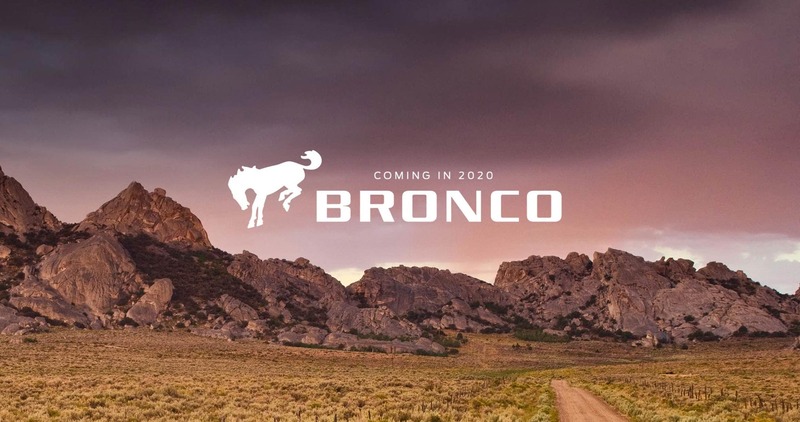 If this is really the direction things are going, unless they plan on delivering a 2020 model in 2021 calendar year, someone over at Ford marketing should probably update all those splash pages that say "20Bronco" and "Coming in 2020". If you click on Vehicles -> Future Vehicles -> GT 500 (Yes, GT 500, not Bronco) it actually says "Available in 2020" for the Bronco which, to me, is even more of a head scratcher. I hope Ford is paying close attention to how Toyota and Acura both screwed up reviving a legacy name by slapping it on vehicles that failed to stay true to what made the Supra and NSX legendary. bigdedition and Stampede.Offroad like this. I'm trying to figure out what a short wheelbase Bronco is going to do better than the Raptor now? And if it is that great, Ford just cannibalized their own sales and probably at less profit. vs trying to steal your own sales on a vehicle that sells 20K per year. Being physically very different from what they're making already is one more item to explain why Bronco development is taking so long. If it was just Ranger architecture with some different sheet metal (which is just an Everest with a boxy shape), that would not take nearly as long to get right as a design that was fundamentally mechanically different. BroncoRevital and 78CreamBrownie like this.